Shunroku Hata (July 26, 1879 – May 10, 1962) was a field marshal in the Imperial Japanese Army during World War II. He was appointed as commanding general of the Central China Expeditionary Army in February 1938, to replace General Matsui Iwane. 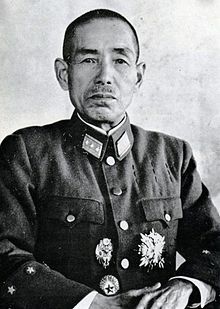 Hata returned to China as commander-in-chief of the China Expeditionary Army in March 1941 and was the main commander at the time of the Changjiao Massacre. He was awarded the rank of field marshal on June 2, 1944. Hata was arrested by the American occupation authorities after the end of the war, and charged with war crimes. In 1948, as a result of the International Military Tribunal for the Far East, he was sentenced to life imprisonment under the charges of conspiracy, waging aggressive war, and disregarding his duty to prevent atrocities. He was paroled in 1955, and died later in 1962. This page was last edited on 16 February 2019, at 13:22.